This concept paper is a joint product of the Institute for Urban and Regional Research of the Austrian Academy of Sciences in Vienna and the European Forum of Migration Research in Bamberg. 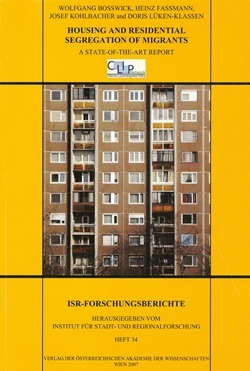 It is based on intensive discussions between the reseachers of CLIP in 2006 and 2007 regarding how the cities should be analysed and which questions are relevant. The main aim of the concept paper is to show the relevant theoretical and terminological concepts and thoughts in the field of housing which were helpful in guiding the research within the cities. The concept paper is one of the written products of the first module. Other analytical products include the city reports, which can be downloaded from the Internet, and the Overview Report which will be published as a written document. To address the stakeholder in the field of housing policy, recommendations for local governments and national and EU decision makers will be published in separate documents.